Since my youth I was fascinated by the thought of Beethoven's 10th symphony. Since I was 13 years old Beehoven was THE expression of beauty and passion for me. So I studied the sketches asking myself what Beethoven might have done with them - and what could I do with them? I started in the 90s with movement 3 and then movement 1. A few years ago movement 2 followed and now in 2011 even the 4th movement. I'd like to stress that unlike Mr. Cooper I did not want to show how Beethoven might have composed his 10th symphony! I simply wanted to use his sketches according to my personal feelings because they fascinated me and they are worth to be heard. In the years 1822 and 1825 Beethoven made several sketches for a 10th symphony. There are sketches for a slow introduction which were realized by Prof. Cooper in such a unsurpassing beautiful way that I didn't even try to make use of these sketches. The sketches for the main theme of the first Allegro in c minor all have the same basic line: a jump to G'', a downward line, and a jumb to Ab''. I believe that Beethoven was fascinated by this motif since his work on his heartmelting Arioso dolente from his piano sonata op. 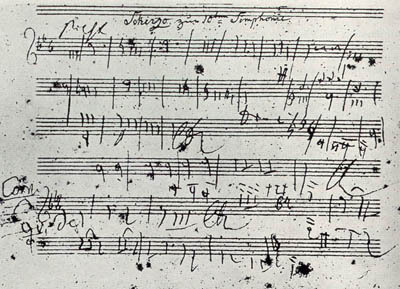 110 which he wrote just some months earlier (which by the way is also very similiar to a famous Adagio from Albinoni). Here you can see the sonata motif, Beethoven's sketches for the 10th symphony and the themes I derived for my symphony. I did not use Beethoven's sketch from 1825 directly as did Mr. Cooper. 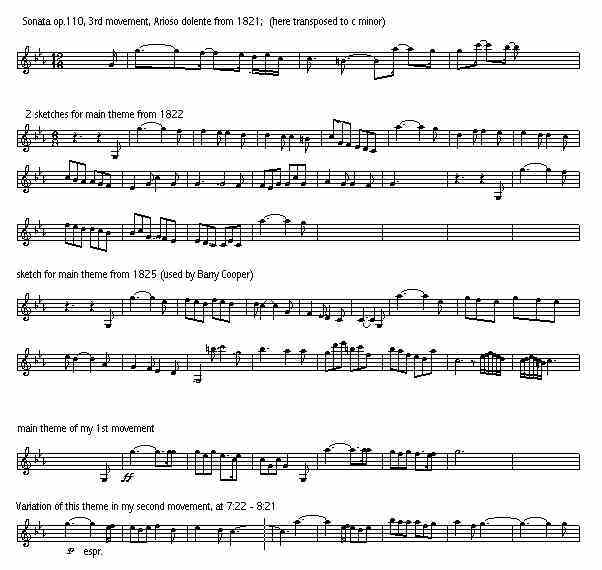 Among the sketches from 1825 there are the opening 24 measures for a Scherzo (titled 'Presto') and the 7 measure theme for a Trio as a middle part of the movement. This Scherzo theme is one of the most furious and powerful Scherzo themes I know, somewhat a mixture of the Scherzo themes of his fith symphony and Schummann's first symphony. I made an atttempt to develop these themes to a whole symphonic movement. The exposition is very bright whereas the development is more a kind of mystical and passionate.